Swinging into stores this fall from WizKids is Marvel Dice Masters' fourth set Marvel Dice Masters: The Amazing Spider-Man. High school student Peter Parker received his abilities when bitten by a radioactive spider and vowed to use his powers to help people. Dice Masters players will be able to follow Spider-Man's lead and accept his "with great power comes great responsibility" philosophy or choose to side with one of the most dangerous rogue's galleries in comic books. Rather than fighting for pure good or evil, players will have more than 30 characters available to build their teams. 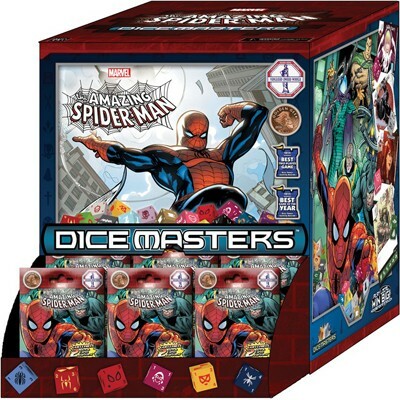 Spider-Man is among the most versatile heroes in Marvel Comics and this is represented by the multiple versions of the character delivered in the Marvel Dice Masters: The Amazing Spider-Man set. Players can select the gutsy Spider-Man who protects New York, the armored scientist Iron Spidey, or various incarnations from throughout the Spider-Verse. Hailing from Earth 982, Spider-Girl May Parker debuts in this set as an example of the spider-themed diversity. Each different version of Spider-Man brings its own flavor and strategy to further your Dice Masters play. The set is great for Rainbow Draft since players will be able to draft from the different versions of Spider-Man and many of his popular allies. As players pick cards and dice they'll be selecting various Marvel Team-Up co-stars: Cloak & Dagger, Daredevil, Ghost Rider, and Black Cat. Players may improve their team by selecting Firestar or Iceman, who appear in the set as Amazing Friends. Other potential draft targets include Heroes for Hire, Luke Cage and Silver Sable, or Avengers, Black Widow and Spider-Woman. Spider-Man's various allies aren't all known for their heroics. 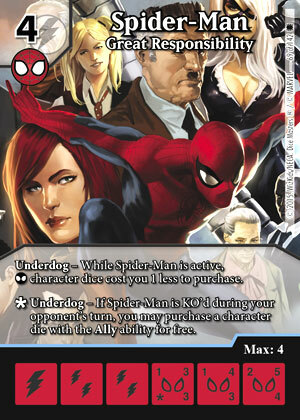 Aunt May and Mary Jane appear in the set with the new Ally keyword. These characters are bought as normal, but while fielded they also count as Sidekicks. In addition to supporting your heroes, these characters can be used to trigger abilities like White Tiger: New Avenger, whose attack increases when a Sidekick is fielded. Another new strategy introduced in The Amazing Spider-Man set is the Underdog mechanic. Underdog represents characters overcoming the odds and rising to the occasion in extraordinary circumstances. Drax: The Destroyer uses Underdog to rush into battle for free and attempt to even the odds for his fellow Guardians of the Galaxy teammates. For players who truly find Spider-Man to be a "Public Menace," there will be many foes who are prepared to help you defeat him. A pair featured in the Starer Set ($19.99 MSRP) are the symbiote Carnage and underworld boss Kingpin. Found in foil packs are classic Spider-Man villains like Green Goblin, Lizard, Rhino, and the gropu organized by Doctor Octopus, the original Sinister Six. Electro, Kraven the Hunter, Mysterio, Sandman, and Vulture all make their Dice Masters debuts in an attempt to defeat Spider-Man. Players new to Dice Masters will have the opportunity to collect additional popular characters from previous sets, but existing players will be excited to see the newer twist on these characters. The symbiote Venom returns as the popular Agent Venom, while Gladiator debuts without the Z-virus. Wolverine and Hulk debut as shield energy characters in the set, with all-new cards and dice. In addition to changing energy types, Hulk: Planet Hulk carries the new mechanic: Aftershock. Just because Gladiator doesn't have the Z-virus doesn't mean there are no Marvel Zombies to be found in the set. Four of Spider-Man's deadliest foes appear infected by the virus. When fielded, these characters will KO their non-Z-virus-infected counterparts and make Spider-Man's day more difficult in addition to their normal abilities. Green Goblin: Rotting Goblin deal damage to opponents for each fielded Sidekick and sends Spider-Man straight to the Used Pile. These super-rare cards will excite both collectors and players alike. With over 140 cards in Marvel Dice Masters: The Amazing Spider-Man, players will have many new options for their epic dice battles. Additionally, a themed Team Box, Dice Bag, and Playmat will be available. Players can challenge their friends or head to the WizKids Event System (www.wizkidseventsystem.com) to find local events! This is from the October 2015 issue of Game Trade Magazine #188. Last edited by pk2317; 09-28-2015 at 07:22 PM. Hmm Zombie Green Goblin sounds similar to Gobby? Note on the image featuring Drax, there is another page of the magazine with more images (my guess it is an ad on the back cover). The card there looks like a cheaper version of Mary Jane. How big a web do you think he can spin? Probably any size. Wonder how he catches thieves. My guess would be just like flies...LOOK OUT! 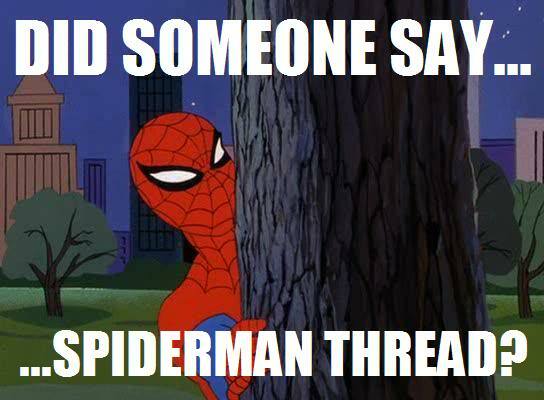 Did somebody say spiderman thread? There are more card images (in low resolution though). One of them explains the Underdog ability: "you may use this effect when your opponent has more character dice in their Field Zone than you do". We have 44 different die faces here. Most of them were accounted for already. Blade and Hobgoblin are guesses as they were not spoiled before. If the image is accurate one of them has to be a zombie. The surprise is the lack of Iron Fist. Last edited by nutki; 09-22-2015 at 03:07 PM. The surprise is the lack of Iron Fist. Confirmation that WK meant what it said. The die was limited to RDW. Yay for follow through! You only listed 3 zombies. Speculations on what was wrong? Actually it looks as if that is Zombie Green Goblin, not regular. ?Underneath his list he says he suspects either Blade or Hobgoblin as a zombie. I'd bet on Blade since we already have one Goblin Zombie SR but you never know. In WoL we got a WW Black Lantern and Star Sapphire SR.
Actually, if you look at the layout of the image, the first three columns and the last row are all distinct characters, and the fourth column is 6 repeated icon and 4 zombie dice. This accounts for the 44 distinct dice images. So, our 4 zombies are Sandman, Green Goblin, Carnage and Hobgoblin. The one looks more like a Zombie Kingpin to me than a Sandman but I haven't been up on the zombie stuff for Marvel so I'm not sure how that would play out. I could see zombie Kingpin. Good spot! I thought there could be a pattern there, but I was mislead by the Green Goblin Zombie face, I just assumed this is a reused Green Goblin from AvX. I don't know that either. I just put some labels on the dice while writing them down so I can easier spot repeats. I think your guess at Kingpin is also likely. This is alphabetical! Only Jack O'Lantern stands out as it does not go between Goblin and Gwen. Since that was a guess it can be another character (or action nope, it had stats on the box images) then. On the other hand it pretty much confirms another guess - Blade. Another Edit: Duh, Also Gwen and Green Goblin are out of order - so maybe I shouldn't read that much from a random image. Yet, Another Edit: OK, I have a working theory pumpkin is simply Green Goblin (after pumpkin bombs) and the other goblin is Hobgoblin after all (which makes him a candidate for a Zombie again). Last edited by nutki; 09-22-2015 at 03:05 PM. Might be spoiler for civil war. Oh gawd, time to way overpay for Iron Fist and Batmobile. Sometimes I hate Dice Masters. Also I just noticed you have Green Goblin after Gwen. Pretty sure that is Hobgoblin. I really hope there is a legit good Spider-Friends team to be built. I would play that team all day every day until Ninja Turtles came out and I can build a Turtles team. I'm kinda' surprised we haven't seen Elektra by now.